The Ontario Federation of Agriculture (OFA) has created many resources to assist municipalities, regions, and community organizations in supporting the agricultural sector. Policy areas such as land use planning, property assessment and taxation, financial incentives, community food planning and consultation provide many opportunities for communities to support agricultural growth. This Guide provides an overview of issues affecting farmers today and identifies opportunities for local communities to support this untapped, and sometimes undervalued, economic sector. OFA’s 52 county and regional federations offer strong, grassroots leadership, and should be your first point of contact when addressing municipal issues affecting agricultural businesses in your community. 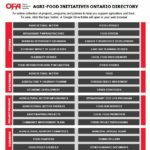 To improve sharing of best practices and resources across the province, OFA has developed a directory of hundreds of initiatives at the local, regional and provincial level that support agriculture and food. This Google Drive of initiatives is open to the public as a dynamic community resource. OFA has developed two complementary resources with background information and an easy-to-use checklist for municipal staff, politicians and community leaders aspiring to foster a more ag-friendly community. OFA compiled several sample job descriptions that may assist your municipality in developing or revising a position to support your agricultural and food sector. The following job descriptions were gathered from actual municipal job postings across Ontario. New to agriculture or looking for new ideas? Check out OFA’s resource for a list of potential activities to examine, promote and support your agricultural community. OFA and the Ontario Ministry of Agriculture, Food and Rural Affairs (OMAFRA) have coordinated a Community of Practice to virtually bring together economic development and planning professionals across Ontario interested in agriculture and agri-business issues.